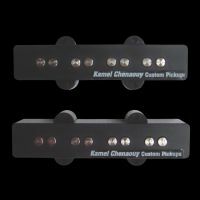 Replacement pickups for Jazz Bass Alnico 5 type. Very defined wide range sound, Brings you back the sound of the 60s with a real enhancement of power, richness and response with a very fine attack. Corrects the well known problem of bad response on Jazz Basses G and B strings. Also available with ceramic magnets.